By his own admission never one to duck a good fight, Stanley Hauerwas has in the past three decades established himself as one of our most important and most disputatious theologians. With A Better Hope, he concentrates on the constructive case for the truth and power of the church and its faith, "since Christians cannot afford to let ourselves be defined by what we are against. Whatever or whomever we are against, we are so only because God has given us so much to be for." 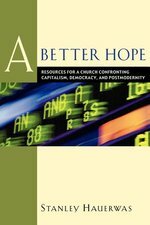 Hauerwas here crystallizes and extends profound criticisms of America, liberalism, capitalism, and postmodernism, but also identifies unlikely allies (such as Chicago Archbishop Francis Cardinal George) and locates surprising resources for Christian survival (such as mystery novels). Interlocutors along the way include Reinhold Niebuhr, John Courtney Murray, and, in a significant and previously unpublished essay, social gospeller Walter Rauschenbusch. Never boring and often telling, A Better Hope demonstrates how a thinker so often accused of being "tribal" and "sectarian" is at the same time one of few contemporary theologians read not just by other theologians, but by political scientists, philosophers, medical ethicists, law professors, and literary theorists.